Delphin Technology AG: The demands on modern measurement software are high: data acquisition and analysis, operation and monitoring, automation and control, and all preferably via web-based remote access. Which solution meets these very different requirements? Tasks in the field of measurement-data visualisation and analysis are manifold. While fast display of current and historical measurement data in y(t) diagrams is sufficient for many applications, others require visualisation of a system's current operating parameters in addition to displaying standard measurement data. Programming a control system for a facility is also often required. Using a complex SCADA system for control and visualisation is too complex and too expensive for many application scenarios. Nevertheless, these tasks need to be carried out reliably and at minimal effort, preferably using a single software package. We therefore provide the ProfiSignal complete software package with the modules Go, Basic and Klicks as well as the new ProfiSignal Web add-on. In which areas of application can the modules be used? ProfiSignal Go covers requirements in data acquisition and analysis. Various configurable y(t), y(x) or logic diagrams are available for displaying measurement data. Many applications require instant switching between live and historical data. This is provided here by intelligent data storage in a database. Measurement data can be recorded continuously or triggered and exported in any common format. The frequent need for online analysis is provided by a variety of statistical tools. Many applications for professional measurement data analysis also require state-of-the-art operating and monitoring functions. Occasions often occur when a diagram needs to be displayed together with a large digital display or warning light, e.g. in combination with a "Stop" switch. ProfiSignal Basic is available to create individual applications that include diagrams as well as visualisation and control elements, e.g. analog and digital displays, signal lights, switches and input fields. Finished applications are accessible to all authorised users and minimum effort is required to create visualisation and operation systems. Complex production facilities as well as test bench applications and laboratories often need to automate test runs. The lack of programming expertise of the technicians involved often makes this impossible. ProfiSignal Klicks is software for academics, technicians and engineers who wish to create and maintain, at minimal effort, their own applications without having to depend on IT specialists. Test procedures are created by clicking together instruction blocks rather than entering program code. Syntax errors are then excluded and learning a programming language is unnecessary. 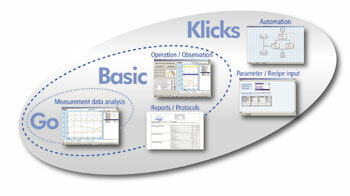 Simple report generation is also possible using ProfiSignal Klicks. Many applications require location-independent access to the latest measurement data and system parameters. During test runs, for example, visualisation of the current measurement data can be helpful. For measurements being performed over widely dispersed areas – such as in field test facilities and in the condition monitoring of machines, systems or structures – location-independent access is often indispensable. With the new ProfiSignal Web add-on, actual measurement data and process parameters as well as historical measurement data can be accessed from any location. The data can be simply displayed in individually created dashboards in the browsers of all user devices. For basic measurement-data visualisation or sophisticated system control, ProfiSignal meets the most varied requirements quickly, intuitively and without the need for programming effort. Simple data trends can be created at just a few clicks along a fast path from sensor to trend. Projects on system visualisation and operation are easy to create and accessible to all authorised persons. Complex control systems can also be created and developed by non-IT specialists and the new ProfiSignal Web add-on meets the increasingly frequent requirement of location-independent system access.